Alexander Klimburg lauds a study on the impact of the Russian disinformation campaign. Alexander Klimburg is a senior non-resident fellow at the Atlantic Council in Washington DC and an affiliate of the Berkman Klein Center at Harvard University in Cambridge, Massachusetts. He is the author of The Darkening Web. Jamieson provides perhaps the first authoritative collection and synthesis of the copious amounts of open data surrounding the 2016 attack. She draws on several published US intelligence accounts, indictments, media reports and a wealth of research in communication studies to reveal Russia’s part in Trump’s victory, and how much it depended on the digital propagation of fantasy narratives to mobilize or demobilize supporters. Russian “discourse saboteurs” (trolls) in St Petersburg “farms” and beyond were able to do two things: exploit weaknesses in social-media platforms, and count on coldly cynical US fellow travellers willing to disseminate false rumours. Unwittingly, the mainstream media, Jamieson reveals, played a key part. For Russia, Jamieson shows, it was win–win–win. If successful, it would get a candidate it thought useful. If not, it would have seeded the idea that Hillary Clinton had rigged the election, making it difficult for her to govern. Either way, through unrestrained intervention, Russia would advance its overriding narrative — that information and speech are weapons that need to be controlled. In addition to her academic position at the University of Pennsylvania in Philadelphia, Jamieson is co-founder of FactCheck.org, a non-partisan website and project of the university’s Annenberg Public Policy Center. It describes itself as a “‘consumer advocate’ for voters that aims to reduce the level of deception and confusion in U.S. politics”. Cyberwar is, appropriately, highly circumspect on what is known and not known about Russian interference in this election. The result is perhaps the clearest-cut glimpse of what an information war looks like. Ultimately, it helps to explain how 80,000 Facebook posts, 131,000 tweets and 1,000 YouTube videos created by at least one group of Russian operatives might have thrown the election. These activities, and sharing by other users, reinforced each other. In the end, the trolls reached more than 126 million Americans through Facebook alone. Jamieson divides her analysis into four key parts, reflecting the intentions of Russian messages: priming, framing, agenda setting and contagion. In nearly all cases, the trolls were able only to amplify or build on the system’s existing weakness. The priming and framing of many election themes preceded the campaign, and were reinforced by troll activity. Clinton’s characterization as a “dishonest” woman was an established Republican framing, as Jamieson shows. 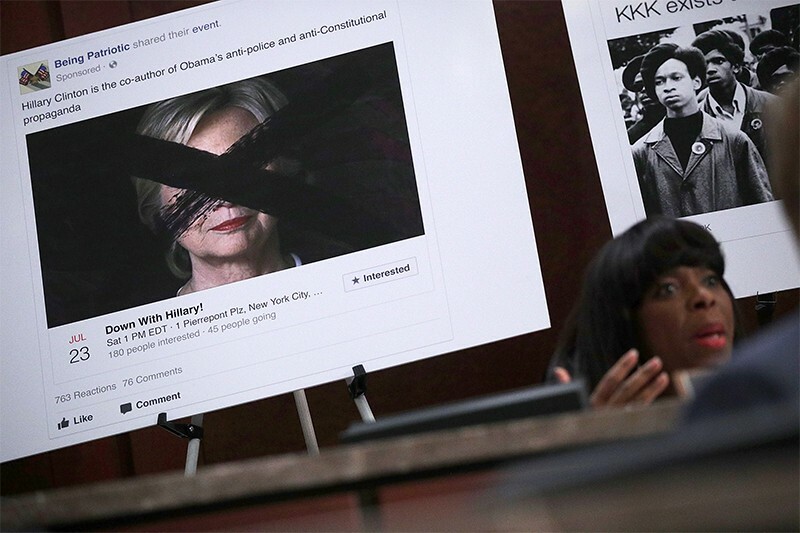 During the campaign, it was constantly encouraged by casting Clinton as a dissembler — for instance, over her use of a private e-mail server, and in relation to false rumours pumped out continuously by trolls on social media, under assumed names. These stories and memes were shared through trusted social connections on Facebook, YouTube, Twitter and other platforms, exploiting the “two-step flow” of propagation, in which interpersonal relationships increase the traction of a message. That flow also helped to set an agenda in the mainstream media. Jamieson shows how much news reportage was triggered by uncritical tracking of Twitter and Facebook memes. Finally, the contagion effect did much to ensure that even attempts to dismiss the more ludicrous conspiracy theories meant that negative associations still clung to Clinton. Facebook became a “contagion machine”, Jamieson writes. Its algorithms quickly learnt that the best way to retain users was to keep them angry and afraid — responses that troll messages were designed to elicit. As Jamieson writes, the trolls aimed strategically to direct attention to hot-button issues such as illegal immigration or police brutality. Exploiting the two-step flow, the trolls gained traction in niche groups by pretending to be extremists in both left-wing and right-wing camps and sending out messages ranging from exaggerations to complete fictions. As Senator Mark Warner (Democrat, Virginia) of the Senate Intelligence Committee recounts, these efforts were largely directed at demobilizing possible Clinton voters. Meanwhile, trolls tried repeatedly to incite violence, attempting to organize at least 129 rallies on both left and right — some at the same time and place, with the clear intent that they should clash. The media’s frames of choice prevented the full implications from sinking in — for instance, casting e-mails hacked from the Democratic National Committee and published in 2016 as ‘leaked correspondence’. And the media inadvertently aided counter-messaging that protected Trump from bad press (such as recordings of him speaking lewdly while filming for the Access Hollywood programme) through the timing of reports, even distracting from US government announcements that a Russian disinformation campaign was under way. Cyberwar is all the more powerful for what it is not. It is not a book of international politics or warfare. Its title is likely to displease those who think it might inadvertently support those actors (such as Russia) who wish to cast information warfare as ‘war’. It does not attempt to portray the full landscape of this new, cyber-enabled cold war. It describes only part of the new conflict paradigm, which also includes Russia’s preparations for ‘real’, critical-infrastructure-crashing cyberwar, along with the slow and steady erosion of the Western alliance, democracies and international law writ large — all in an attempt to fulfil a zero-sum world view in which Russian greatness can be (re)achieved only by vanquishing the country’s implacable foes. Indeed, Jamieson plays little heed to accusations that the actual electoral system — voting machines and voter registries — might have been tampered with. She concludes (rightfully, in my view) that if they had been, the manipulation would probably represent only a fraction of the votes ‘stolen’ through troll activity. In the end, Jamieson’s final analysis is clear, if not explicit: Russian trolls must have swung many more votes than the 78,000 in 3 crucial states that constituted Trump’s winning Electoral College margin. Indeed, the reader is left with the distinct impression that the number of affected votes was probably orders of magnitude higher. Cyberwar provides a convincing model of how the old Soviet ‘active measures’ of propaganda, honed throughout the twentieth century, can be enacted with great effect under the new media order. Most importantly, Jamieson specifies the roles of complicit citizens and an unwitting media. By showing that modern Western democracy has a significant existential challenge, she has set us on the path to help patch it — if only we are able to move fast enough.